We're opening the doors for our hugely popular semiannual warehouse sale once again! This year we'll have extended hours, kicking the weekend off on Friday afternoon. Come explore thousands of discounted remainders—fiction, cookbooks, children's books, comics, art, history, science—plus rare and unusual used books just waiting to be discovered. What are remainders, you ask? They are bargain books, new books at dramatically discounted prices. Remainders at Harvard Book Store are typically 40-80% off the original list price, and this weekend at the Warehouse Sale we'll be taking 15% off the already discounted remainder prices. 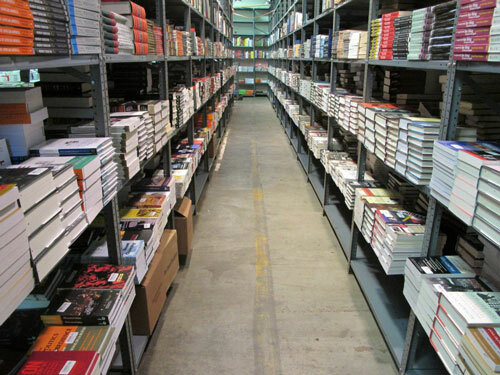 We also have hundreds of deeply discounted used books. All used books will be an additional 70% off their already marked down prices. Accepted forms of payment include credit cards (American Express, Discover, MasterCard, Visa), cash, and checks. Gift cards and Frequent Buyer discounts cannot be redeemed at the Warehouse Sale. We apologize for any inconvenience. Our warehouse is located on Park St. in Somerville, just off Somerville Ave. The closest T stop is Porter Square, on the Red Line, and bus lines #83 and #87 have stops on Somerville Ave. near Park St. Parking is limited in the area, so public transit is recommended. We're continuing our popular Twitter/Instagram promo: Tweet or instagram your favorite finds using #HBSWarehouseSale this weekend, and we'll pick one winner from each day to receive a $25 Harvard Book Store gift card. Follow us on Twitter at @HarvardBooks and Instagram at @harvardbookstore. As you exit the station, turn right down Somerville Ave and continue about 4/5 of a mile until you reach Park Street. Turn right down Park Street, and the Warehouse will be on your left. Bus lines #83 and #87 have stops on Somerville Ave near Park Street.